It's that time of year again. Wedding season is upon us and many couples have already set a date for the upcoming months. Spaces have been rented, guests have been invited, and everything is ready, except for one thing – finding the right hairstyle for the ceremony. For a woman that is struggling to discover the exact look that will give her the memory of a perfect wedding, it can be frustrating to sift through loads of pictures without finding the right style. Thankfully, there are some wedding looks that are already becoming 2012 hits and have a classic and timeless appearance that make them perfect for any women getting ready to tie the knot. If the woman is getting married in the spring, then a fresh look like the one pictured above may be the right style. Airy and light, this look may have a little less in the refined elegance department, but is a great choice to show off a woman's facial structure. Attention is pointed to the cheekbones, chin, and eyes and a tiara works as a natural accompaniment to balance out the style. Even 20 years later, this hairstyle will still look good in pictures and the combination with an outdoor setting for the service will make it hard to beat. Another fresh look that can make for a stunning bride is to simply go with natural hair framed by a hairpiece made of flowers. This look works best when it is paired with a more simple wedding dress. Early weddings in 2012 are seeing many women adopt this style and for good reason. It holds up well over time, requires little work on the actual wedding day, and can be recreated easily whenever a woman wants to relive her wedding. At the same time, if a woman finds this style a bit too relaxed, maybe one of the next examples will be a better fit. This glam style worn by Kerry Washington obviously has its roots in 1950s and 1960s hair culture, but somehow feels modern at the same time. A bridge between simple and elegant, the look works great with a veil and a woman that want to mix things up can pull the hair back during the ceremony and let it down for the reception. The trick to getting a good glam style is for a woman to avoid going too retro. 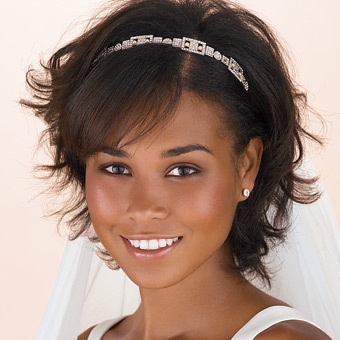 It's a thin line, but when it's done right, this style may be the best possible look a woman can have for her wedding. If embracing the elegance of a wedding is the order of the special day, then it's hard to go wrong with a classic updo and this relatively simple version is a great way for a woman to bring attention to her face. Of course, it works perfectly with a veil and nearly any style of dress, but the best combination is to match this look with a refined high-cut dress to give a complete air of refinement. In choosing a specific wedding updo, a woman will need to avoid something overly complex as it can easily overshadow the face, dress, and other components of the woman's appearance.